China has banned James Cameron's blockbuster Avatar due to concerns over the film's themes of eviction and relocation. In case you haven't heard, James Cameron's sci-fi romance epic Avatar is very, very popular, smashing record after record on its way to challenge even mighty Titanic as the highest-grossing film of all time (though a #2 spot isn't really all that bad, either). The story may be a cliche, but the stunning visuals and imagery have helped it resonate with moviegoers across the world in a way few films do, but the movie resonated with audiences in China in a very unique way - a way that has gotten the movie banned from theaters in the world's most populous country. Amidst concerns that Avatar's themes of forced eviction and relocation in order to support industry would spur social unrest, the state-run China Film Group ordered Avatar pulled from the nation's 1,628 2D screens, effective this Saturday, January 23rd. The film's banning would also help theaters make room for a biopic of the famous philosopher Confucius starring Chow Yun-Fat - a film more in line with the values espoused by the nation's government. While Avatar will remain playing on China's 900 3D screens until the planned end of the run at the end of February, 3D-equipped theaters are much harder to come by in the Chinese mainland, making this an effective blanket ban, writes ICM. The ban comes in reaction to many Chinese moviegoers, who viewed the forcible relocation of the Na'vi people on the planet Pandora as an allegory for an experience suffered by many Chinese in the country's crowded cities: The government's Chengguan evicts people from smaller homes that their families have lived in for generations in order to build commercial and industrial high-rises for the sake of the country's economic development. Many outspoken social critics and bloggers noted the parallel between the situations faced by the blue-skinned Na'vi and inner-city Chinese living in old-fashioned neighborhoods. In the China Daily, a writer named Huang Hang wrote that "the film struck a chord with Chinese audiences and created nothing less than a social phenomenon. Why? All the forced removal of old neighbourhoods in China makes us the only earthlings today who can really feel the pain of the Na'vi." These sentiments were echoed by popular Chinese blogger Han Han, who added that "For audiences in other countries, such brutal eviction is something outside their imagining. It could only take place on another planet or in China." "Social phenomenon" seems an apt way to describe it, given the long lines for the film seen in Shanghai - have you seen photos of people camping out for Avatar in any other country? I sure haven't. 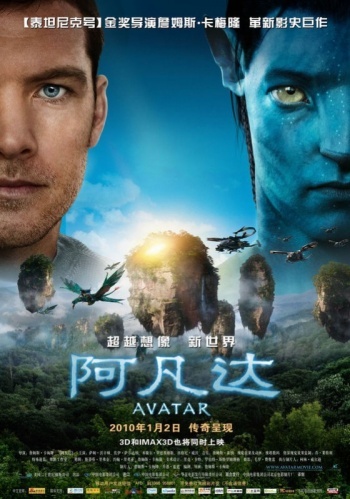 Indeed, the success of Avatar may have earned it some enmity in the Chinese government all on its own, earning 300 million RMB ($40 million) in its first eight days of release - an embarrassing amount of money for local filmmakers. Fortunately, China being China, it won't be so easy to stamp out the film once and for all - pirated DVDs of the film are already on streets, meaning that those who identify with the situation on Pandora can still experience it for themselves.